A Jet Ski Guide to Getting The Most Out of Your Ride - KC Jet Skiing and Watersports Book Now! An incredible fact about riding Jet Skis is the extremely exciting on-water experience that jet skiing gives the rider. One of the most unique things about riding a Jet Ski is the nimbleness, speed and power of the Jet Ski and it is essential that you, the rider, get the most out of your experience. It is your choice whether you want to cruise within the intercoastal waterways of pompano beach, or power through the ocean, this guide will show you the techniques, instruction and fun that you will encounter during your Jet Ski rental here at Pompano Beach. Once you have rented your Jet Ski and have gone over the standard protocol of operating these personal water crafts, it is a good idea to build and develop a skillset on driving the Jet Ski. The most familiar way to ride a Jet Ski is in the sitting down position, with your feet forward on the footrests and your legs slightly bent. 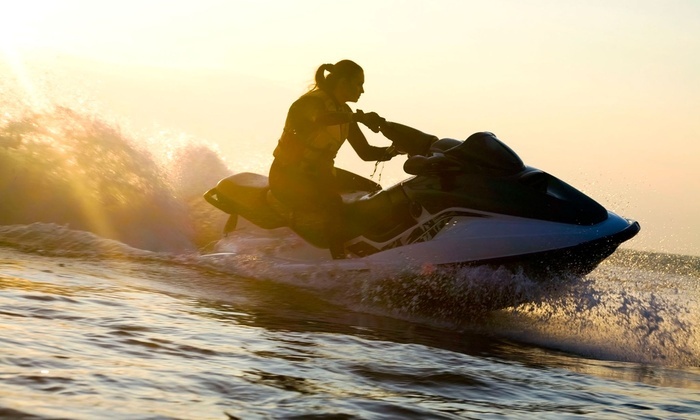 The benefits of riding in this relaxed position is that it helps you absorb the shock of waves, and sitting in this position allows you to turn better while leaning in with your Jet Ski turning. You’ll often people riding in the stand up position because this allows them more control over the Jet Ski, and their legs act as shock absorbers when in contact with big waves. You can accomplish this move by standing and placing your feet slightly back enough from the handlebars and shoulders. Riding in the semi-standing position with the knees slightly bent allows you handle choppy Pompano water in case, or lean while turning and jump the Jet Ski if you want to. We suggest you cruise in choppy waters, and rip the waves when it’s calm. It is important to be mindful of others around you or on your Jet Ski. It is imperative that you always look behind you while making turns. Jet Skis were designed to turn on a dime and can be maneuvered nimbly between other crafts,people, waterways and most things in its path. When riding with other passengers, it is important to ensure their safety as well as yours, by asking them if they’re good to go. To get the most out of your ride and avoid falling with your passenger, have them lean in forward during corners while you turn. When riding at slow or idling speeds have the passenger remained seated and still to avoid rolling over the Jet Ski. When returning the Jet Ski, after experiencing the waves and thrills of the Pompano waters, It’s best to practice docking as essential technique to your Jet Ski repertoire. Docking techniques can be practiced depending on the type of dock whether still or not. To execute this move, the rider has to approach the dock at a reduced speed prior to docking to avoid collision or injury, and another trick to reduce your momentum is to make a hard 360 degree turn 20-30 feet in front of where you are docking. Lowering your forward momentum allows you to dock at a safe speed, which ensures your safety and others as well. As you approach the shoreline, shut off the engine and allow it to coast to the original Jet Ski rental location on Pompano beach. Exit your Jet Ski when it is shallow enough to do so, and if it is deep dock, slowly approach with the engine off, and grab hold of the dock to stop the Jet Ski. These are the essential tips to getting the most out of your ride, while being out here on the beautiful Pompano waters. Jet Skis give you the option to cruise and enjoy the view, while giving you the power of full- throttle shredding power on the intercoastal waterways of Florida.